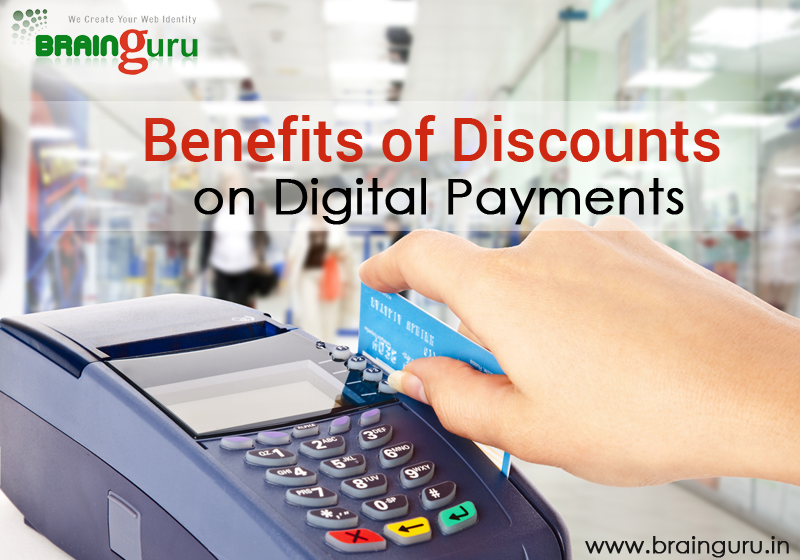 Benefits of Discounts on Digital Payments | Brainguru Technologies Pvt Ltd.
Demonetization has impacted almost everybody in the country, it has changed the way of payment and using money. Through this method, citizen of the country has adopted the most effective way of using currency. Majority of the people have gone cash less, this has made flexible for the people for using the currency. This adoption has completely altered the lifestyle of the people. Now everybody buy things through credit cards and debit card as they don't need to carry cash all the time. Shortage of cash is the major problem in the country, due to this the flow of cash has blocked for sometime. As far poor people are concerned they are facing problem in getting the right amount of cash. As there is always a long queue outside the bank and the ATM to get the cash. For this problem, government of India has come up with new plan to make people free from cash . On Thursday Prime Minister Narendra Modi has introduced an effective plan for going cashless. He has introduced discount offers on the online payment of petrol, railway tickets and insurance policies. This has made life easier for the citizen to buy things easily. Digital Payment is the most authentic way of making any kind of payment, you can purchase things easily and free from the chaos of paying any kind of token money. Not only that digital payment gives you an opportunity to win reward points through which you may get extra discount on any type of purchase. This decision was made on the one month anniversary of the demonetization decision. PM Modi also highlighted the key aspects of using card instead of cash. Finance Minister Arun Jaitley stated that there would be 0.75% discount on petrol, 10% discount on the e-wallet and 8% discount on life insurance. Digital Payment has revolutionized the flow of payment,public sectors are offering discount if you buy things from them. Through Digital Payment, you may also get the monetary benefits so that you could enjoy the process. Arun Jaitley has offered discount on the railway ticketing and buying insurance policies through PSUs. This method would be helpful for the nation to get digitized completely. Instead of standing in the queues for the long time it is better to get to pay through e-wallet or card.